Everything is summed up in the face. I may take 40, 50, 100 pictures of a person, and the one I like best is when the face hasn’t caught on to the next expression the brain wants it to make. 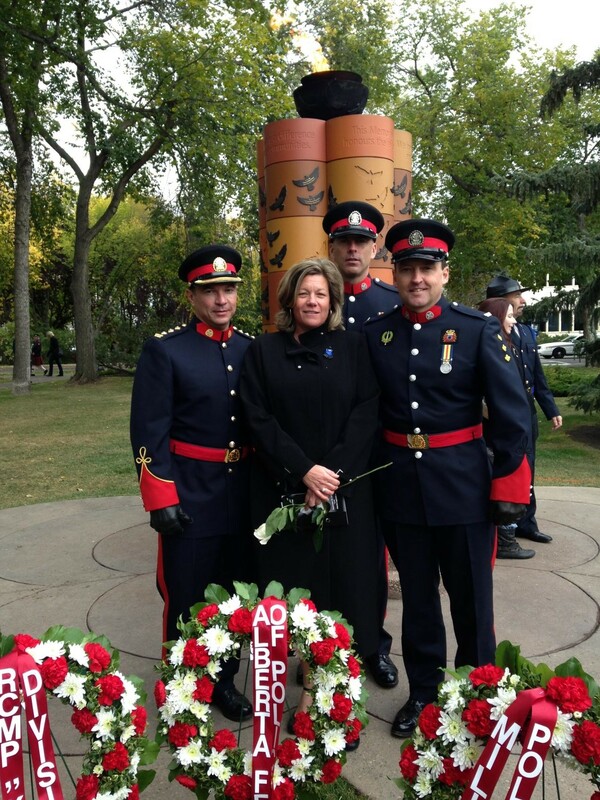 This photo was taken in Edmonton last week (Sunday September 29th, 2013) at the annual Alberta Peace & Police Officer’s Memorial Service. Since this year’s service fell on the 13th anniversary of John’s death, he was the officer highlighted this year. The pillars we (myself and the three police officers who started the John Petropoulos Memorial Fund) are standing in front of has the names – engraved on butterfly-shaped plaques – of every Alberta officer who has died in the line of duty. It was a powerful service. As such, my smile in the above photo looks a bit wonky…as if my face hadn’t caught up to the next expression my brain wanted it to make. Moments before this photo was taken, I had spoken to the media about why public memorials such as this are important – both for the family & friends of the fallen officer, as well as for the thousands of living officers who put their lives on the line on a daily basis…and their loved ones, who hope to God they never get the call I did. Thankfully, I also got the chance to mention the John Petropoulos Memorial Fund (JPMF) and how the public can play a significant role in helping ensure emergency responders make it home safely to their families after every shift. Services such as these are difficult because they bring to the surface all the old sorrow. Yet they are also tremendously cathartic – in small doses – because those tears are a healthy release. Memorial services have their place, absolutely. But I think it is in our everyday actions where we can most honour the ones we’ve lost. What I was feeling most during the service this year was gratitude – for all that John gave me in life and in death, for our friends and family, for the police officers who started the JPMF and for the amazing people who work tirelessly for the Fund to help create a culture where workplace safety for everyone is a top priority. Interestingly, it was the K-9 dog, standing proudly with his handler beside their colleagues in the Edmonton Police Service, who I focused on throughout the service. I wasn’t quite sure why the dog gave me comfort but I felt an unmistakeable connection to John. Perhaps it was the way the dog seemed a bit agitated, as if he’d had enough of all the pomp and circumstance and bagpipes and wanted to get back to work! When I finished writing the first draft of this article yesterday, I shut my computer off and went into the kitchen to start dinner. I turned on the radio and what I heard felt like a kick to the stomach. A K-9 dog, Quanto, from the Edmonton Police Service had been violently killed in the line of duty. Now I look at the above photo from a different perspective. Perhaps the expression on my face isn’t just a reflection of old sadness – but also an intuitive awareness that another name would soon join the collection of butterflies on the pillars behind us. Well written and nicely introspective! Well…you certainly never disappoint, either in word or in spirit! This is beautiful, Maryanne! Thank you so much for sharing.